With the beginning of Spring starting to emerge I decided it was time for a wardrobe update with some new season staples. I've been looking for a camel coat for a while now but have struggled to find one that suited me. That was until earlier this month when I found the Misguided Camel Biker Coat. It's a lovely thick, faux wool coat with an asymmetric front and exposed biker style zips on the sleeves and pockets. The length is really flattering and although the sleeves are a little long, there's something about the boyfriend-style fit that makes it work. For all you petite gals, this one's a winner! As I usually wear a lot of black it's been a really nice change to add a bit of colour to my wardrobe and helps to break up an outfit. Today I styled it with my trusty Topshop Leigh Jeans, New Look Gold Ring Pocket Shirt and ASOS Play It Cool Heels. 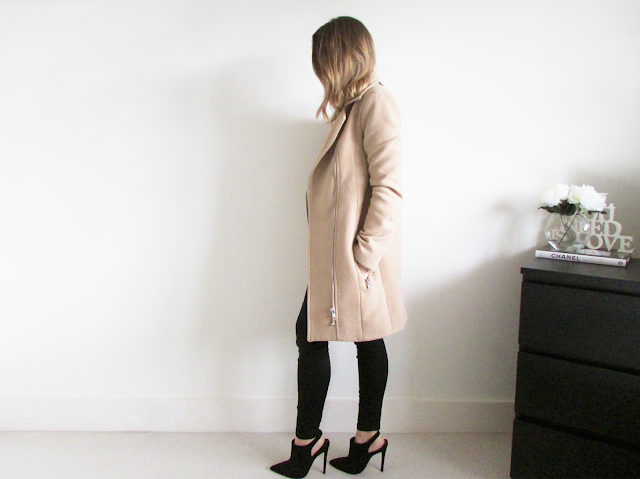 It's the perfect trade up from my usual leather biker, and undoubtedly warmer!